Open educational resources (OERs) are one of the biggest trends right now in education. In this blog post, we’ll detail what OERs are, some setbacks they have, and if OERs can strategically support the publishing industry as a viable business opportunity. According to UNESCO, OERs are “any type of educational materials that are in the public domain or introduced with an open license,” meaning teachers can freely use, distribute, and even modify the content to match their needs. OERs come in a variety of formats and appear in classrooms as texts, videos, audio files, animations, and textbooks to support student learning. OERs can also manifest as lecture notes, syllabi, and even assignments to help teachers plan their lessons and manage their teaching goals. Teachers can get these OERs across the internet. Some examples of popular OERs include the Massachusetts Institute of Technology open courseware and Amazon Inspire. More teachers are using OERs in their classrooms with no signs of slowing down. A 2017 Babson College survey found that the awareness teachers have about OERs grew significantly from 2014 to 2017, leaping from a 34% awareness rate to 44% rate in just three years. Image credit: Babson Survey Research Group 2017 “Opening the Textbook: Open Education Resources in U.S. Higher Education” report. Babson also reported that one of the primary reasons why OERs are attractive to teachers is because materials are entirely free. The Babson respondents commented that they wanted to make education affordable for their students and by using OERs it reduces the financial burdens on students. What keeps teachers from adopting OERs? 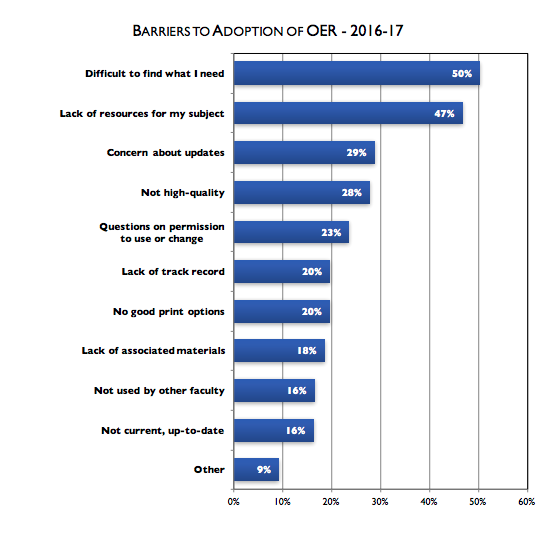 Babson asked what keeps teachers from adopting OERs. The survey uncovered a few setbacks which concern quality and quantity. These setbacks to OER adoption indicate that there isn’t a centralized body producing these materials nor providing proper instructions on how to use them. As a result, educators can’t find high-quality materials they trust and hesitate to use the content they find online for fear of copyright infringement. Are OERs an opportunity for publishers? Yes, OERs provide an opportunity for publishers. They can help publishers distinguish themselves in the competitive and ever-changing education sector. Though it might seem counter-intuitive, by creating high-quality educational materials and giving them away for free, can increase profitability. OERs will only continue to grow in prominence, and the publishers that offer the broadest set of high-quality materials will establish themselves as a leader in the industry. Publishers can distinguish themselves as the “go-to” education source. Providing valuable OERs to teachers and education institutions will also help boost the overall trust. As students and teachers associate publishers with high-quality OERs, they are more likely to buy publishers’ content if they need a more extensive resource rather than a limited, free resource online. This positive brand recognition is a powerful tool for long-term benefits. Open educational resources will continue to grow as important tools for classrooms around the world. Publishers are in a unique position to capitalize on this business opportunity. Publishers should create high-quality OER content to meet the doubling knowledge demand. OERs will help position publishers to longer term positive association as well as play a greater role in defining and shaping the role of OER in the classroom. Want to know more about the state of AI in Education right now? 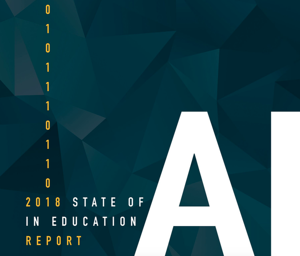 Download our 2018 "State of AI in Education" report below.